Heat butter in a skillet. Add green onions and salt. Stir and saute 1 minute. Add mushrooms and continue sautéing for 2-3 minutes over medium heat. Stir in scallops and sauté for about 4-5 minutes, until scallops are opaque. Sprinkle with black pepper, add lemon juice and heat through. 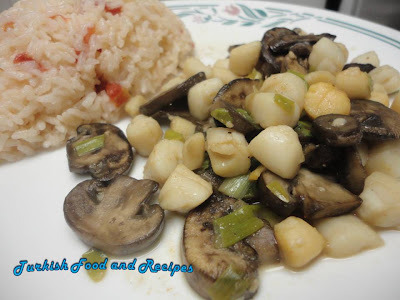 You may serve scallops with mushrooms with tomato pilaf. Tereyagini tavada eritin. Yesil sogan ve tuzu ilave edin. Karistirin ve bir dakika kadar sote edin. Mantarlari ilave edin ve 2-3 dakika kadar orta ateste sote etmeye devam edin. Deniz taraklarini ilave edin ve 4-5 dakika soteleyin. Karabiber serpin ve limon suyunu ilave edin. Domatesli pilav ile servis yapabilirsiniz.